Ukraine SOF Participate in CbR XI. Ukrainian special operations forces participated – along with SOF from four other nations – in exercise Combined Resolve XI in December 2018. The U.S. Army exercise had 16 nations participating nation – with five contributing SOF units. This is the first time that members of the 3rd Ukrainian Special Operations Forces Regiment has been at the Joint Multinational Readiness Center (JMRC) at Hohenfels, Germany. (SOCEUR DVIDS, Jan 29, 2019). Uzbek SOF Train in U.S. A special forces unit of the Uzbek Defense Ministry has been taking part in exercise Southern Strike based at Camp Shelby, Mississippi. See “Uzbek special forces train in U.S.A.”, Army Recognition, January 29, 2019. 1st SFG Drops into Yuma. 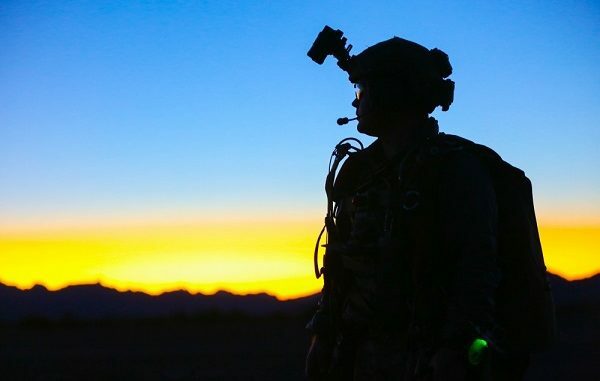 Green Berets from the 1st Special Forces Group spent some time in Yuma, Arizona on a three week training exercise to hone their high altitude low opening (HALO) and high altitude high opening (HAHO) skills. One of the techniques they practiced was that of ‘bundle chasing’. Read all about it in “1st SFG(A) Green Berets drop into Yuma Proving Grounds”, 1st SFGA DVIDS, January 29, 2019. OBL Secrets to Remain Secret. Some memos containing the written opinions of lawyers from a number of U.S. intel organizations drafted in 2011 providing legal guidance for the Navy SEAL raid to capture and/or kill Osama bin Laden in Pakistan will remain secret. The U.S. Court of Appears ruled that the government did not have to make them public. Judicial Watch was attempting to get the records released. Read more in “Obama’s Secret Rationale for the Raid on Bin Laden”, Bloomberg Opinion, January 29, 2019. Jet Packs for SOCOM? By this summer U.S. Special Operations Command could be testing prototype jet packs for its operators. Technology is improving dramatically in this area. (Task & Purpose, Jan 29, 2019). SOCOM Seeks Capabilities Assessment. The U.S. Special Operations Command is looking for companies that can help SOF possess the necessary capabilities to function effectively a decade from now. (ExecutiveBiz, Jan 28, 2019). Stan on Leadership. The former commander of the International Security Assistance Force (ISAF) in Afghanistan – and earlier a JSOC cdr – has a new book out on leadership entitled “Leaders: Myth and Reality“. Since having a lapse in judgement in a bar in Paris (something about drinking with a left wing journalist) he has since become an expert on leadership. Read a review of his book – “Gen. Stanley McChrystal: 5 takeaways on leadership”, Military Times, January 29, 2019. SF Soldier, Vietnam Vet, and NFL Receiver. Everyone knows the story of Rocky Blier – the wounded vet who returned from Vietnam and rejoined the NFL. He starred with the Pittsburgh Steelers for several years in the 70s. Rocky is a fascinating personality; I heard him speak at the 2018 Special Forces Association Convention. In the same time decade there was a Green Beret, also wounded in Vietnam, who played for the LA Rams. But hardly anyone knows the story of Willie Miller. Read “This Ram Was a Patriot”, Slate.com, January 29, 2019. 19th SFGA Soldier Pleads Guilty. SFC Henry Royer, a former member of a National Guard Special Forces Group will plead guilty for his involvement in an alleged cocaine smuggling scheme. An accomplice, MSG Daniel Gould of the 7th Special Forces Group, has been discharged from the Army. They attempted to smuggle cocaine from Colombia. See “Second soldier pleads guilty in cocaine case”, NWF Daily News, January 29, 2019. New SOJTF-A Cdr. BG Chris Donahue, currently w/ J-3, Joint Staff, in DC will soon command Special Operations Joint Task Force-Afghanistan. 7th SFGA Officer Sentenced. Major Jason Sartori is going to jail for 10 years for assault on his wife. (Army Times, Jan 30, 2019). SOFME Exercise in New Mexico. Special Operations Forces Medical Element (SOFME) members of the 27th Special Operations Medical Group have been participating in an exercise at and near Cannon AFB. Read “SOF medical element strengthen capabilities in exercises”, 27th SOW PA DVIDS, January 28, 2019. Civil Affairs – A Needed Capability in Today’s World. If the United States is going to be able to stay ahead of near-peer adversaries during the ongoing ‘great power competition’ it must integrate Civil Affairs into their strategic and operational planning and execution. CA plays a major role in both traditional and irregular warfare activities and assist in preparing and shaping the operational environment throughout all stages of the conflict continuum. Read more in “Great Power Competition: The Fight for Weak States”, Small Wars Journal, January 30, 2019. Cyber Warfare and IW Principles. Three writers dive deep into “. . . how cyberspace operations (CO) fit into national security as an instrument of national policy.” At the end of a very long and informative article they conclude that comprehending the similarities between cyberspace operations and irregular warfare “. . . characteristics, principles, and theories, leaders at the strategic, operational, and tactical levels can frame their thought processes and formulate coherent plans.” Read “Applying Irregular Warfare Principles to Cyber Warfare”, Joint Force Quarterly 92, National Defense University Press, January 22, 2019. Flying Apaches. An Apache pilot tells us all about the good and bad of his flying machine. Read “Confessions of an Apache Pilot: What It’s Like to Fly the Military’s Most Heavily Armed Attack Helicopter”, by James Clarke, Task & Purpose, January 23, 2019. Task Force on Lethality. One of SECDEF Mattis’s accomplishments was the establishment of the Close Combat Lethality Task Force in 2018. Read up on what the TF has accomplished thus far and what lies ahead. (Military Times, Jan 29, 2019). 3rd SFAB and D-30s. The 3rd Security Force Assistance Brigade is training all of its 13 series Soldiers on the 122mm D-30 Howitzer. This exposure to the soviet bloc artillery piece will prepare them for upcoming missions around the world. Read “3rd SFAB prepares to train foreign allied forces”, DVIDS, January 10, 2019. More Troops for Border. The Pentagon confirmed on Tuesday that thousands of additional troops are heading to the southern border. They will be adding concertina wire and providing surveillance support. (Military Times, Jan 29, 2019). Threat Assessment. Leaders of the U.S. intelligence agencies testified before Senate Select Committee on Intelligence on Wednesday, January 29th about threats that the United States face around the world. Daniel R. Coats, the Director of National Intelligence (DNI), provided some opening remarks to kick things off. In addition, The DNI also provided a 41-page document entitled Worldwide Threat Assessment of the US Intelligence Community. From Defense to Offense. Here is an interesting take on how NATO has changed its mission over time. Ted Galen Carpenter (of the CATO Institute) presents an ‘alternative view’ of NATO. The North Atlantic Treaty Organization has, over the past few decades, shifted from being a defensive organization concerned about an aggressive Soviet Union to one that has intervened in ‘non-NATO’ matters (Kosovo, Bosnia, Afghanistan, etc.). “The new missions reflected a dramatic expansion of NATO’s geographic coverage.” See “What the Evolution of NATO’s Missions Means for the Future”, The National Interest, January 27, 2019. Russia’s Hybrid War. Kirk Bennett, a retired U.S. Foreign Service Officer, provides a speculative look into the Kremlin elites’ thought process in the struggle with the West. Read “How Russia Plans to Win the Hybrid War”, The American Interest, January 28, 2019. Understanding the Russian Threat. A recent 211-page report examines Russian hostile actions and measures in the Baltics, Southeastern Europe, and elsewhere. Read Russia’s Hostile Measures in Europe: Understanding the Threat, RAND Corporation, January 2019. Another Cold War? The Kremlin has launched a strategy of political warfare against the West. It is using disinformation, cyber attacks, and other tools of influence to undermine the U.S. and other Western nations. Read “Are U.S. and Russia in a new Cold War?”, Brookings Institute, January 20, 2019. Germany to Lead VJTF. The Germans have taken the lead for the NATO Very High Readiness Joint Task Force. They will keep thousands of soldiers on standby and ready to deploy within days. Italy had the VJTF lead brigade in 2018. (UK Defence Journal, Jan 30, 2019). Assisting Ukraine. The Global Security Contingency Fund is helping to build the tactical, operational, and institutional capacity of the Armed Forces of Ukraine. (DoS DIPNOTE, Jan 29, 2019). Korea . . . and Problems. The continuing saga of North Korea and its nuclear weapons development has been going on for years. A recent 24-page report explores the complex problem sets these weapons pose in Four Problems on the Korean Peninsula, RAND Corporation, January 2019. Syria – Presidents, Bureaucracies, and Policy. Aaron Stein provides his thoughts about the U.S. policy in Syria, defeat of ISIS, and how Trump’s administration did not formulate a policy or strategy that supported the president’s desired path and outcome in regards to Syria. Read “America’s Almost Withdrawal from Syria”, War on the Rocks, January 29, 2019. Sen McConnell on Syria. Mitch McConnell has come out strongly against a hurried withdrawal from Syria – saying that ” . . . al Qaeda, ISIS, ad their affiliates in Syria and Afghanistan continue to posed a serious threat to our nation.” Read his press release entitled “Strengthening America’s Security in the Middle East Act”, January 29, 2019. Roads Linking DJ and Somalia. The Department of Defense has embarked on an ambitious project to link Camp Lemonier in Djibouti to camps in Somalia overland. The project is part of a broader military entrenchment in Africa. Read “U.S. Developing Supply Route Along Dangerous Stretch From Djibouti to Somalia”, Foreign Policy, January 26, 2019. Venezuela Violence. The demonstrations, looting, detentions, and deaths continue in Venezuela. At lest 40 people are believed to have been killed in recent violence. 5,000 Troops to Colombia. National Security Advisor was either exhibiting an absurd lack of OPSEC, tweaking the media for fun, or sending a message to Venezuela. He recently was at a press conference holding a yellow legal pad and pen. Clearly visible on the legal pad were the words “5,000 to troops to Colombia“. So, being inquisitive I checked with the CIA’s map library. It appears that Colombia shares a border with Venezuela. (I knew that, having spent some time in Colombia!). The Pentagon, however, is somewhat quiet on the prospect of sending troops to the region. (Military Times, Jan 29, 2019). Possible NEO for Venezuela? One Twitter Tweeter – Micah Zenko @MichaZenko – speculates that 5,000 is not nearly enough troops for an intervention. The interventions of Dom Rep (1965) had 40,000, Panama (1989-90) 28,000, and Haiti (1994) was 20,000. Zenko says 5,000 is a good number for setting up an intermediate staging area in Colombia and conducting a noncombatant evacuation operation (NEO). Report – Stabilization in Conflict-Affected Countries. A group of writers from the Center for Strategic & International Studies has published a report on DoD stabilization efforts and recommendations for improvement. CSIS, January 22, 2019. Using Proxies in the CT Fight. Brian Katz, a fellow in the International Security Program at the Center for Strategic and International Studies, has wrote up a tract entitled Imperfect Proxies: The Pros and Perils of Partnering with Non-State Actors for CT, CSIS, January 29, 2019. GAO Report on OCO. The U.S. Government Accountability Office has published Oversas Contingency Operations: Alternatives Identified to the Approach to Fund War-Related Activities, 36 pages, January 28, 2019. Video – Russia and the U.S. in Syria. Bob Hamilton, someone familiar with Syria, provides a presentation about the Syrian conflict. Topics include a background to the conflict, U.S. – Russian deconfliction, Russian goals, tactics, and methods in Syria, and the U.S. withdrawal. U.S. Army War College, January 17, 2018, one-hour. ‘Deep Fake” Videos. A new type of video will soon be getting popular due to advances in technology. This will create a potential for new kinds of misinformation with devastating consequences. Paul Scharre, a technology expert for a New American Security explains. (Jan 27, 2019, 2 mins). Video – Southern Strike. 20th SFGA and Uzbek SF conduct operations at Camp Shelby Joint Forces Training Center. (DVIDS, Jan 28, 2019, 1 min). Photo: 1st SFGA Soldier at Yuma Proving Grounds – An SF Soldier after a night HALO parachute jump at Yuma Proving Grouds Arizona. Photo by SGT Ian Ives, 1st SFGA, Jan 26, 2019.